Cohesive Linerboard & Cold Seal Packaging | American Printpak, Inc.
Kraft linerboard is a strong, stiff paperboard often used to cover one or both sides of a corrugated medium to make containerboard (the material cardboard boxes are made of). That being said, American Printpak utilizes the properties of this paper to manufacture cohesive kraft linerboard that is used as a durable protective packaging material. The main benefit of cohesive linerboard packaging (other than the fact that it’s self-sealing) is that it minimizes product movement during shipping and provides extra protection around object surfaces and edges. As trusted cohesive linerboard manufacturers, our cohesive linerboard is also perfect for packaging and protecting products with more size and mass (like textbooks, automotive parts and other larger, heavier items). Our cohesive kraft liner board can be produced in many different shapes, sizes and weights. The following sections outline these specifications and limitations. If you have any questions regarding our linerboard sizing capabilities, please send us a quote request – we will respond promptly. Latex Cohesive – Product can be customized to meet seal and peel performance requirements. Cohesive linerboard is used in a variety of markets but has been particularly successful for packaging applications such as books, binders, and DVDs. 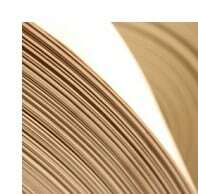 Want to know more about Cohesive Kraft Linerboard Protective Packaging? Ask us!